Applying for small business merchant accounts is a vital step when starting a business as you will want to accept credit card payments. Merchant account services and credit card payment processing have changed over the years and many new providers have entered the market. In Canada there are a few major merchant account credit card processing companies. Their fees have continually increased with add on charges for supplies as well as nonsensical breakdowns for existing fees. As they introduce these changes they slowly increase not only the fees themselves, but also the bank fees for the extra transactions required to process the minute breakdown of all the fees. This is not surprising since the merchant account services are owned by the banks and increased account transactions coincidentally make the profits go up on both ends. Knowing that, I urge you to shop around before opening a small business merchant account. In Canada there are some merchant account providers, such as First Data, that offer great rates. Typically, the lowest rates available for transactions are those made using a credit card terminal. You may have to rent a credit card terminal monthly, while other credit card merchant providers will ask for a deposit towards purchasing a credit card machine. The advantage of having a credit card terminal is that you get an authorization for the transaction on the spot, the rate is much lower, and you can accept direct payments (debit.) 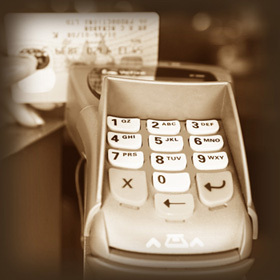 Credit card terminals can certainly make credit card payment processing much easier. The disadvantage is that they usually come with a high price tag, in terms of monthly fees, which is not always cost effective for those who have seasonal sales. With the growing trend for Smartphones, there are an increased number of merchant providers that offer processing that can be used with your phone and a phone app. These providers usually have competitive rates without the monthly transaction fees. Some also offer the availability to accept debit. If you live in the US there are numerous credit card merchant account providers and it is advisable to shop around. that's easy, with no monthly fees, you will want to sign up with this company. Square is progressive with streamlined, easy access processing. When searching for a merchant account provider, check with your local craft associations, organizations and craft councils before applying for a merchant account. Craft associations often get group deals with credit card merchant account providers who specialize in opening a home business merchant account. By signing with the small business merchant accounts provider offered through a craft association you can save a fair bit on merchant credit card fees and rates. Some large-scale show promoters also partner with merchant credit card providers and offer group rates to their exhibitors.